When childhood clumsiness is really something more. Lucas has always been a clumsy kid, bumping into walls and knocking things down. His parents worried when he didn’t start speaking until he was more than three years old, and even now, in first grade, he mixes up sounds in words, saying “hopsital” instead of “hospital.” His teacher is concerned because Lucas can’t seem to hold his pencil correctly and learning to write is a serious struggle. He won’t play catch on the playground, and other kids make fun of his slightly slurred and slow speech. Lucas’s parents take him to visit a neurologist, who finds nothing physically wrong. He suggests Lucas might have actually have dyspraxia. Get a printable version of this free poster from TES Resources. Dyspraxia is often called “developmental coordination disorder,” and that’s a good way to think of it. People with dyspraxia have difficulties coordinating their physical actions. This can affect a variety of activities, including walking, writing, and talking. Dyspraxia can be mild to severe, but it does not affect intelligence. Most people with dyspraxia are of average or above-average intelligence. Dyspraxia is surprisingly common. It’s estimated to affect between six and 10 percent of the population, with boys more commonly experiencing this condition. Sometimes the condition is so mild that it’s never diagnosed, but for others, the symptoms greatly interfere with daily life. Experts believe there is at least one child with some form of dyspraxia in every classroom. 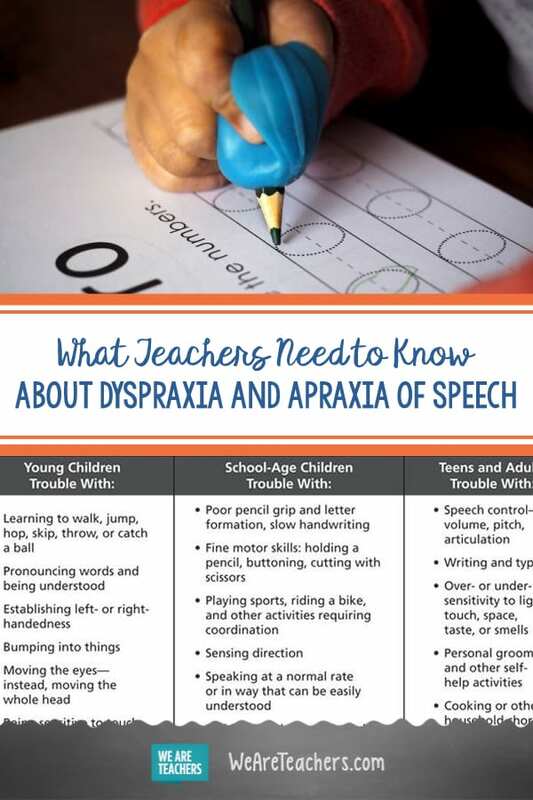 You may sometimes hear dyspraxia called “apraxia of speech.” It takes a great deal of muscle coordination of the face, mouth, and tongue to speak properly and clearly. Those with dyspraxia often cannot coordinate those muscles well, so their speech can be slurred and indistinct. Apraxia of speech is part of the larger dyspraxia continuum. Kids don’t outgrow dyspraxia, but they can improve their symptoms and learn to focus on their strengths. They often need speech therapy, occupational therapy, and physical therapy from experts, so early identification is key. Learn the signs of dyspraxia. 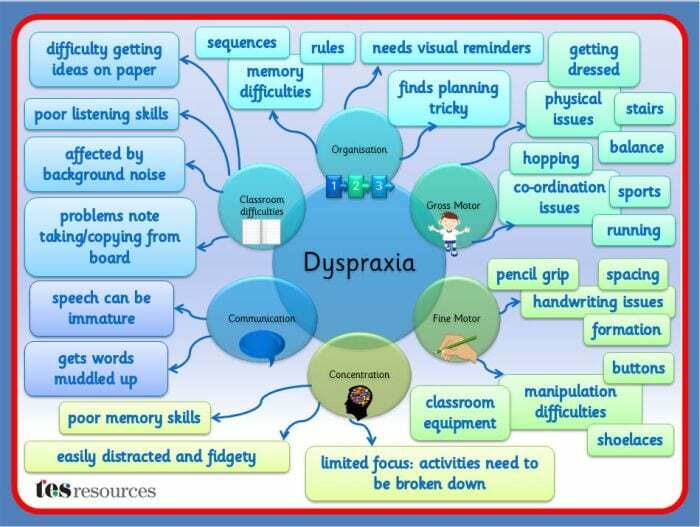 Knowing the signs of dyspraxia can help teachers with struggling students. If you think a student in your class is affected by dyspraxia, refer them to the appropriate specialist. They’ll rule out any neurological conditions and make a diagnosis if necessary. Here’s what you might see in a dyspraxic student at various ages. At this age, dyspraxia is hard to definitively diagnose, since kids develop at different speeds. But a dyspraxic toddler will usually learn to speak later than other children, possibly not speaking full words until the age of three. They’ll also take much longer to learn to talk in complete sentences. They’re often very clumsy, unable to catch a ball or use scissors. 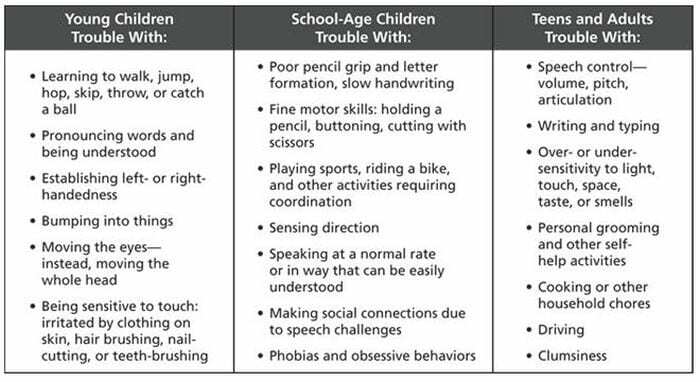 Learn more about pre-K dyspraxia signs here. This is the age at which dyspraxia is most commonly diagnosed. Speech problems become more apparent, with the slurring of words and difficulty moderating pitch, speed, and volume. 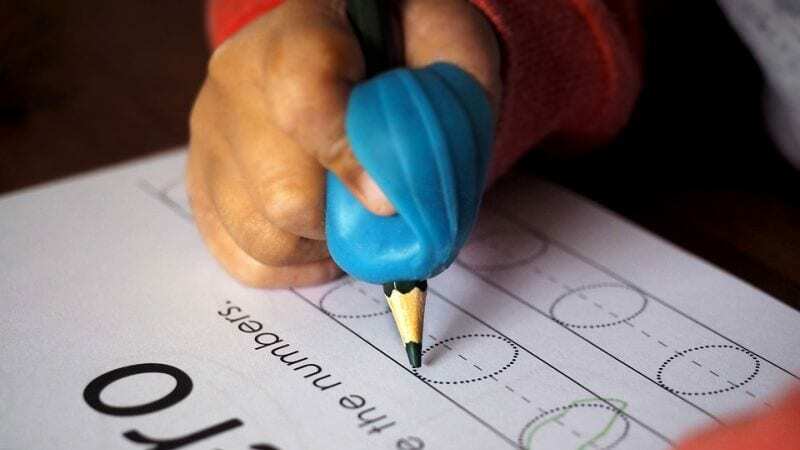 Writing may be difficult, as the fine motor skills needed to hold a pencil are lacking. These students are physically clumsy, and they struggle to learn to ride a bike or tie their shoes. They also find sequences of actions confusing and often take much longer to complete seemingly simple tasks. Learn more about elementary school dyspraxia signs here. Older students with dyspraxia have trouble keeping up with note-taking during lectures because handwriting is difficult. They may continue to demonstrate indistinct speech, which may vary wildly in volume and speed. Dyspraxic students avoid gym class and playground activities, because they lack coordination. They have trouble following long sequences of directions, and seem to take forever to do their homework. Learn more about middle school and high school dyspraxia signs. Due to the challenges of speech and coordination, dyspraxia can be a very visible condition. Kids with dyspraxia may have trouble making friends or even be bullied. Learn about the social impacts of dyspraxia here. Students diagnosed with dyspraxia may qualify for an IEP/504 plan that requires classroom accommodations. Even if they don’t have a formal plan in place, there are many ways you can help dyspraxic students succeed, including those listed below. Get more classroom strategies for students with dyspraxia here. Encourage and support speech therapy. Making yourself understood is very frustrating when your mouth simply won’t move the way you want it to. Speech therapists can help dyspraxic students with apraxia of speech speak more clearly over time. Refer your student, if needed, and work closely with the therapist to ensure you’re supporting their work in your classroom. 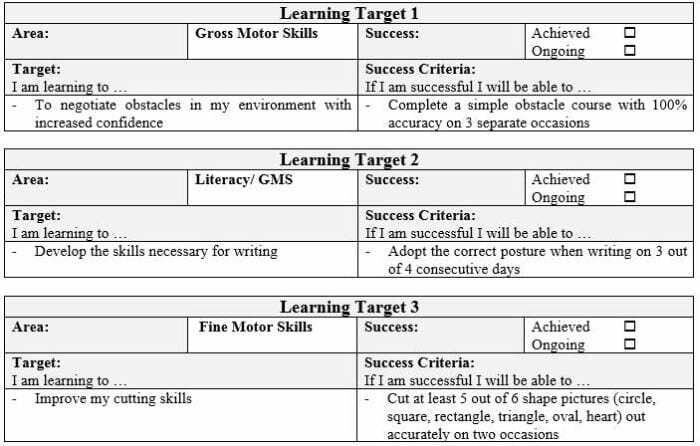 Writing requires fine motor skills that many dyspraxic students don’t have. Teach writing using alternative methods and provide different utensils, grips, and paper. Encourage them to learn to type at an early age. Provide preprinted copies of notes from lectures and give extra time for written assignments. Break down projects and instructions. Kids with dyspraxia often struggle with a series of instructions—they need to take things one step at a time. A checklist is immensely helpful for them, especially with projects that require multiple steps. Help them break things down into manageable chunks so they can stay on track. Watch for signs that a dyspraxic child is being bullied by others and refuse to tolerate that behavior. Kids with dyspraxia may have trouble making friends on the playground, since their lack of coordination makes it hard for them to play physical games, like ball or tag. Suggest other group activities they’ll enjoy instead and help them find children they’ll enjoy playing with. The more you know about dyspraxia, the better equipped you’ll be to support your students. Here are some resources to check out. Do you have questions about helping students with dyspraxia? Come ask other teachers in our WeAreTeachers HELPLINE Facebook group. People with dyspraxia often have dysgraphia, too. Learn more about dysgraphiahere.